Traditional, convenient and multi-purpose. 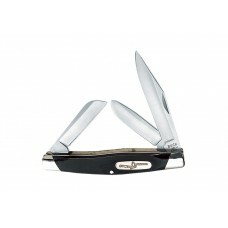 The Stockman® is the largest three-bladed knife available from Buck. The clip point blade is good for detail work, the spey blade is perfect for skinning or sweeping knife strokes and the sheepsfoot blade is perfect for giving a clean cut, especially on a flat cutting surface. Blade Lengths: Clip: 2 ¾" Spey: 2" Sheepsfoot: 2." Made in the USA.